Have you ever wondered which Republican catch phrases could actually land a candidate in office? Well, truth be told, there are several that could land an average candidate in the power seat. Many would agree that George W. Bush got elected as President of the United States not only due to the savvy way that he related to the people, but more for many of the Republican catch phrases that he used when he spoke. The thing about a catch phrase is that it may not always be a phrase. In many cases, it could simply be a word that is used in the context of a hot social issue. If you think back over the years, you will begin to recall hearing words that candidates said over and over again. If you pick up any newspaper you will be able to see the plethora of catch phrases used by Republicans. For instance, in 2005-2006, the key catch phrases that were used by the Republican party were, "family values" and "activist judge." Other familiar catch phrases that many Republicans may toss around are "soft on terrorism" and "war on terror." "Going Green" - This means to be more environmentally friendly. "Staycation" - This refers to staying at home during "vacation" time off. "First Dude" - Coined by former Governor Sarah Palin of Alaska, the term "first dude" refers to her husband. "Maverick" - Definitely a term that can be synonymous with a catch phrase however this was the Republican catch-all term of the 2008-campaign season. This particular term refers to someone who is looking for change. 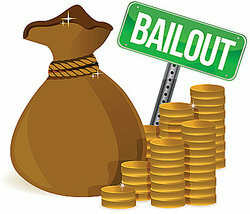 "Bailout" - This was yet another catch-all phrase that managed to cross party lines. This particular term refers to the monetary assistance that has been given to various industries to help them alleviate debt. Hopefully this brief list will help you to better discern which common catch phrases are a major part of the Republican lingo. Catch phrases, whether Democratic or Republican have long been infused into the speeches of potential candidates as a mechanism that triggers or stimulates a want in a potential voter. Politicians are masters at the use of catch phrases. While many (if not all) of them have political consultants and writers on staff that prepare their speeches, others opt to do it on their own. Nonetheless, politicians have mastered the hidden art of using the quintessential catch phrase in order to catch and keep the attention of voters at large. It is no secret that the average American is quite susceptible to a cleverly worded catch phrase. Catch phrases are crafted with a particular target in mind. While the innate aim is to secure a vote, in order to do that an speech or sentence needs to be carefully crafted and infused with a plethora of catch phrases that the target group will find relatable. For example, if your target group to secure votes from were those people who are unemployed, then it would make sense that you use a few catch phrases about creating job opportunities. Catch phrases are basically specific phrases that are used when there is a discussion on a controversial issue. When a catch phrase is used, you will usually notice that a candidate often begins to refer to a personal account, something that is allegedly personal to them. The use of catch phrases can frame a debate in the favor of the individual or political party. Similarly the use of catch phrases can also work to repel the target audience from supporting a particular political party or party platform. "Republican Catch Phrases." YourDictionary, n.d. Web. 20 April 2019. <https://quotes.yourdictionary.com/articles/republican-catch-phrases.html>.